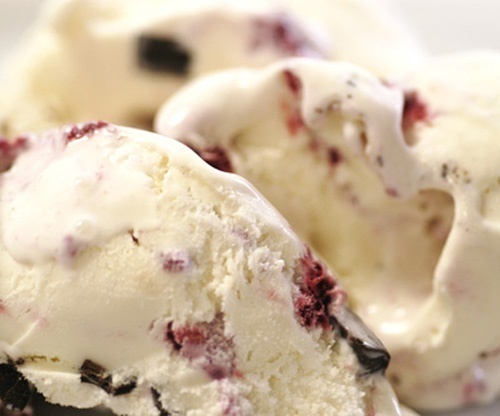 Winemakerssister: Happy Ice Cream Month! I'm not sure that I ever need an excuse to enjoy ice cream, but here's one. July is Ice Cream Month... yay! As part of the Knitter's Holiday swap (what a perfect holiday to celebrate), I just received this great ice cream themed package. It came from a swapper in Vermont, so it was filled with all sorts of wonderful Vermont goodies -- Ben & Jerry's scoop, gift certificate, and Chocolate Chip Cookie Dough pencil, along with Vermont maple syrup and a bumper sticker from Gardener's Supply. 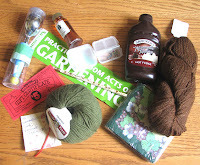 The yarn is gorgeous -- a green-tea colored skein of merino and some chocolate-colored alpaca. She also sent a wonderful little container to hold stitch markers (and some cute ones were included inside), napkins (in case of dribbles), and chocolate sauce.